With the help of the Pew Research Center’s new data analysis, I have seen the future and indeed, it is all about us. That would be the year 2055, when Pew says Asian Americans will be the largest immigrant group in America, if current trends and policies continue. But I hope it won’t be time for me to kick the bucket just yet. If I hang in ten more years until 2065, the Asian American population is expected to make up 38 percent of all foreign-born immigrants in the U.S., surpassing Hispanics at 31 percent. By then, we should expect everyone to come kissing our collective Asian political butts. We may even have the legislative clout to make Lunar New Year a national holiday, signed into law by the first Asian American president. If I’m still around, by virtue of my vegan diet and not cryogenics, I’d definitely say it’s a good time to go amok. Once again, these aren’t pie-in-the-sky numbers. This is the trend predicted by Pew that shows our dramatic rise as a community, from less than one percent in 1965, to six percent in 2015, to more than double again–14 percent of the total U.S. population by 2065. But you don’t have to wait 40 years to celebrate. You can start celebrating now. 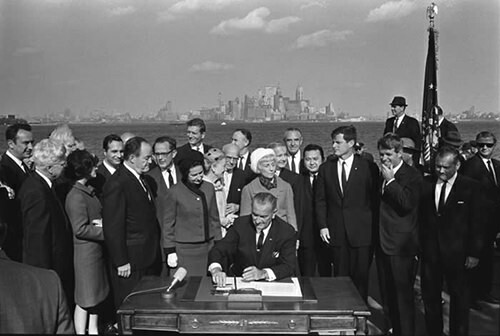 On Oct. 3, it will be 50 years since President Lyndon Johnson went to the Statue of Liberty to sign the Immigration and Nationality Act of 1965, also known as the Hart-Celler Act. That sounds like an America for the people who talk about a not-so-great wall and use the term “illegal immigrant” as an act of defiance.If that’s you, note that there are seven states where pre-1965 conditions exist at 1 percent or less Asian, according to the 2010 Census.There’s Maine and North Dakota at 1 percent; Mississippi and South Dakota at .9 percent; Wyoming, .8 percent; West Virginia at .7 percent; and Montana at the bottom with .6 percent.Imagine the visitor bureau slogans: Go to the Dakotas, where it’s still 1965 for Asian Americans! You can probably get real MSG in your egg foo young.But there’s no model minority and no Tiger Mom, and “Fresh off the Boat” is really about bass fishing.So you see how very important the Hart-Celler Act, the 1965 immigration reform law, really was for Asian Americans.Go ahead. Start celebrating now that law signed on Oct. 3.It’s the day that ended Asian “immigration interruptus,” and allowed us to fulfill our destinies in this Boomland called America.